A patent application granted to Apple and published today by the United States Patent and Trademark Office (USPTO) suggests that Apple could still be planning to launch its much rumored ‘iWatch’ or other health and activity-related wearable device. The description in the filing is specifically for “Wrist Pedometer Step Detection”, which sounds a lot like the job done by existing fitness bands like the Nike+ Fuelband (and SE) or Fitbit. 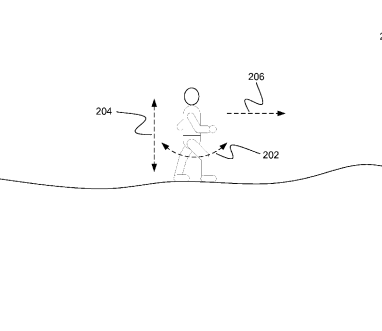 However, from the sounds of the methods described, it seems that the patent is looking to do away with erroneous step counts and would enable any device it was used in to be able to detect whether it was on a wrist, placed in a pocket or somewhere else. Essentially, by monitoring forces (gravity) when a person takes a step and when they are between steps, a pedometer can accurately measure the total number of steps taken. This patent argues that when worn on a wrist, pedometer counts are less accurate and can over or undercount steps taken. By being able to detect when a device is being worn on a wrist, adjustments (for things like arm-swing) can be made to ensure that the count stays accurate. It’s not exactly confirmation of an Apple smartwatch/healthband, but it’s certainly the kind of technology we’d expect to see from the company if it was going to launch one. It has already shown a penchant for fitness tracking with the inclusion of the M7 motion coprocessor in the iPhone 5s, so it wouldn’t be too surprising to see Apple enter this increasingly crowded space. For now, let’s just hope it ends up looking something like these concept designs.